42 Architects are a young architecture and design studio established by Johan Berglund and based in London, UK. As a practice they are driven by the belief that architecture can enhance our society through excellence in design, coupled with contextual sensibility and a strong understanding of the social, cultural and environmental needs of our times.42 Architects have recently designed a spatial installation for UK fashion retailer Topshop in London, working to a very tight timeframe of only three weeks from concept to completion. Inspired by hurricanes and tornadoes, a temporary architecture mimics the circular patterns of airflow. 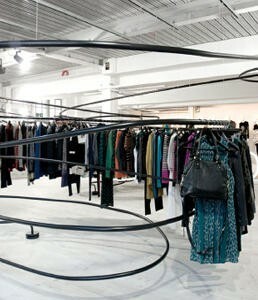 Twister proposes a spatial configuration built of swirls, swooshes, vortexes and eddies – manifested as a system of hand-formed black PVC coated tubes onto which garments can be hung. Visitors are invited to follow the structure as it winds through the room, while encountering collections of displayed garments along the way. The black tubes also act to bind the various collections together into one thematic whole. Around the structure sits a second layer of smaller white structures; benches and tables that hold shoes, accessories and makeup displays, as well as acting as seats for visitors.42 Architects take great interest in the relationship between body and space, with architecture acting as a mediator that can provoke and promote very specific types of uses and movement patterns.